Size of this PNG preview of this SVG file: 600 × 400 piksel. Other resolutions: 320 × 213 piksel | 640 × 427 piksel | 800 × 533 piksel | 1 024 × 683 piksel | 1 280 × 853 piksel. English: Flag of en:Moldavia in the 14th-15th century. Update: the auroch was always black (or another dark colour). The star was golden, while the rose and the moon were silver in colour. 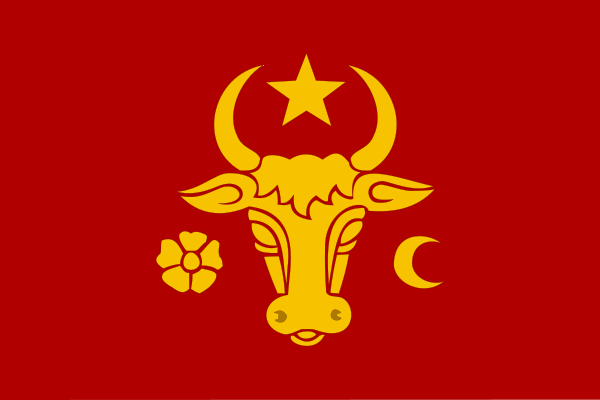 The first informations regarding the color of the Moldavian flag (including elements) comes from a book of documents published in Krakow in 1533: The grand flag had a red field on which was nicely painted with gold the coat of arms of Moldavia (banderim magnum sericeum, coloris rubri, in quo arma terrae Moldaviae pulhre auro depicta erant). 18:53, 5-Oktabr 2013 512 × 512 (766 KB) Spiridon Ion Cepleanu Conform sursei Grigore Jitaru, ''Blazoane domnești în Țara Romînească și Moldova'', Editura Uniunii Scriitorilor, Chișinău 1997, 216 p., ISBN 929.621.478.9 : replasat soarele între coarnele bourului.